Several years ago, Leander Kahney released a well-received biography of Jony Ive, outlining how the publicity-shy "genius behind Apple's greatest products" came to play such a prominent role at Apple. Kahney painstakingly researched Ive's background, interviewing numerous friends and acquaintances from various stages of his life to put together a portrait of Apple's design guru. Kahney has now returned with another biography of an Apple executive, and this time he has his sights focused on CEO Tim Cook. Like Ive, Cook is an intensely private person, but Kahney spoke with a number of friends and family members, as well as former coworkers and even a few current Apple executives to learn more about the leader who has had the gargantuan task of following Steve Jobs. While Apple has had some considerable successes under Cook, some have been critical of the direction the company has taken under his leadership, whether it be product missteps, a perceived lack of innovation, or changes in the company's focus. Kahney finds little to dislike about Cook's tenure, however, as is made immediately clear by his book's title: Tim Cook: The Genius Who Took Apple to the Next Level. Kahney centers his book around six values he argues "provide the foundation" for Cook's leadership at Apple: accessibility, education, environment, inclusion and diversity, privacy and security, and supplier responsibility. After a quick look at Cook's 2011 elevation to the CEO position and the death of Steve Jobs, the book delves into Cook's history, starting with his upbringing in Alabama and his time at IBM and Compaq. The book then looks at his decision to join Apple upon the return of Jobs when the company was still on the brink of bankruptcy, and his operations prowess that saw Apple streamline and outsource its manufacturing, radically improving efficiency and allowing for the scale of growth Apple was to experience. The bulk of the biography covers Cook's time as Apple CEO, highlighting his transition into the role and some of the early major product announcements like iPhones, Apple Pay, the Apple Watch, and more. The book's focus then turns to broader themes like Cook's emphasis on the environment and sustainability, privacy and the fight with the FBI over creating a backdoor into iOS, and efforts at increasing diversity. The book wraps up with a look at Apple Park and the company's work on self-driving car technology, and ultimately asks whether Cook is the best CEO Apple has ever had. Analyst Horace Dediu believes that he is, arguing that Jobs was "always the head of product" and "never really a CEO." That emphasis was needed when Apple was fighting for survival, but as Apple got back on its feet, Jobs largely turned over the day-to-day operation of the company to Cook, and Cook's generalist perspective has been what the company needs now that it has matured. While the book does highlight a few missteps along the way, The Genius Who Took Apple to the Next Level is overall a glowing portrait of Cook and the job he has done leading Apple. You can agree or disagree with that conclusion, but either way, it's an interesting look at one of the most important figures in Apple's history and a story that hasn't really been told at length until now. With material drawn from those who knew Cook in his early days, as well as current and former Apple executives like Lisa Jackson, Greg Joswiak, Deirdre O'Brien, and Bruce Sewell, Kahney does a good job of weaving new bits of information into parts of the narrative that are already well known. If you're interested in hearing more from Kahney about his book and the process of writing it, we held an "Ask Me Anything" session with him in our forums earlier today. Stop by our forums to see what questions our readers had for him and what he had to say. 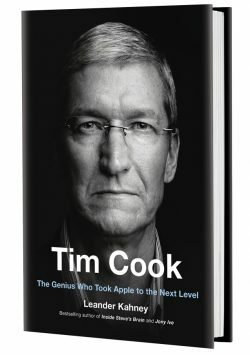 Penguin Books has also graciously agreed to offer ten copies of Tim Cook: The Genius Who Took Apple to the Next Level as part of a giveaway. To enter to win, use the widget below and enter an email address. Email addresses will be used solely for contact purposes to reach the winners and send the prizes. You can earn additional entries by subscribing to our weekly newsletter, subscribing to our YouTube channel, following us on Twitter, following us on Instagram, or visiting the MacRumors Facebook page. By request of the publisher, only U.S. residents who are 18 years or older are eligible to enter. The contest will run from today (April 9) at 7:00 a.m. Pacific Time through 7:00 a.m. Pacific Time on April 16. The winners will be chosen randomly on April 16 and will be contacted by email. The winners will have 48 hours to respond and provide a shipping address before new winners are chosen. For those interested in purchasing the book, it launches next Tuesday, April 16, but you can pre-order now through Amazon, Apple's Book Store, and other outlets. Is this the correct title? Shouldn't it be 'Tim Apple, the guy who ran out of ideas after Steve's plans and made minor incremental updates and canned any sense of technological innovation whilst introducing major price hikes whilst other brands get ahead'. This book is going to cost just $299.99 because it has a memoji front cover. We think you're gonna love it and pay this ridiculous price instead of adding a USB C port. Wasn't April Fool's Day last week? This is a little late. Tim Cook, the Genius who took Apple into politics. Where would I find this book, in the fiction/fantasy/propaganda category? What is the next level, announcing a product which does not even exist? Should be “Tim Apple”. Jus sayin.